Fraser Valley condos had an explosive year. As condo prices ballooned in Greater Vancouver buyers were pushed further and further away from the city. This is a typical phenomenon in Real estate booms called ‘the drive to qualify’. Buyers who are desperate to enter the Real Estate market become more willing to drive further into the suburbs in an attempt to enter the market. As prices get bid up in the suburbs this attracts a growing investor base and only adds to higher prices. The run up in the Fraser Valley has lagged Vancouver, it started in the detached market and has now worked it’s way to the condo market. While Vancouver condos also had an exceptional year, growing by 13%, it pales in comparison to the 25% increase for Fraser Valley condos. The average sales price of a Fraser Valley condo increased by 25% in 2017 to $326,014. The median sales price increased a whopping 30% to $310,000. 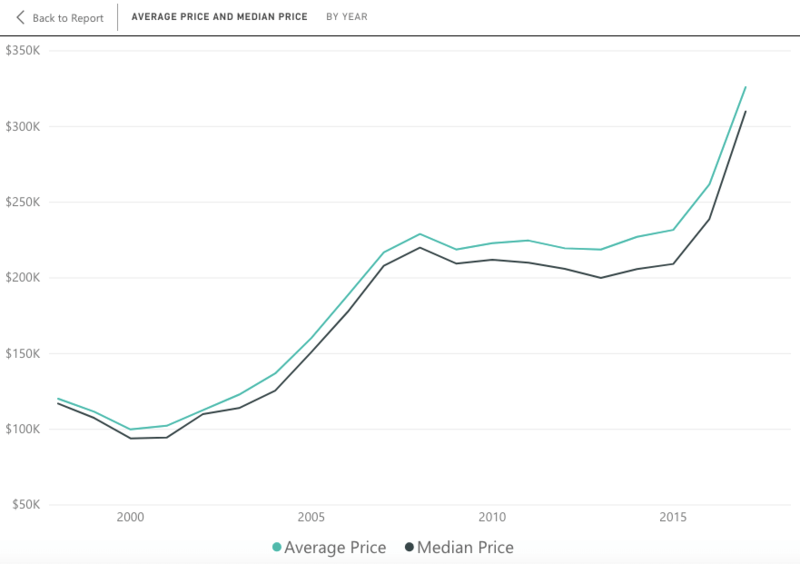 Fraser Valley condo Average & Median Sales Price. 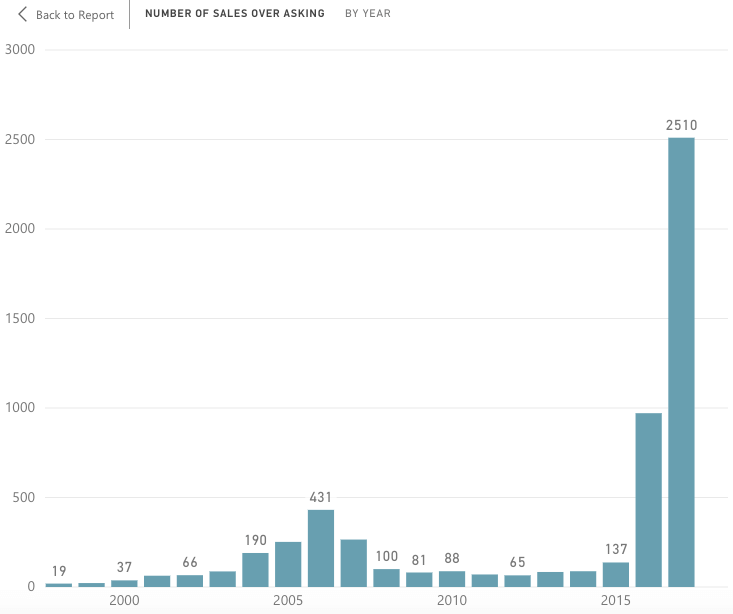 With condo sales increasing to a record high (22% increase year over year) and the average sales pushing upwards of 25% it resulted in dollar volumes hitting a record high of $1.89B. This was a 52% increase from 2016 and equivalent to an extra $648M spent on suburban condos. This kind of windfall will have the provincial government salivating as property transfer tax revenues simultaneously hit record highs. 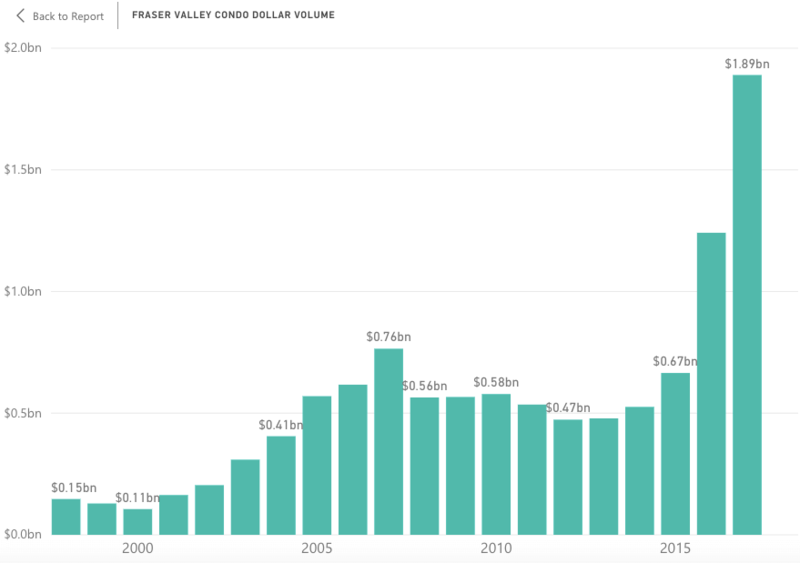 Fraser Valley Condo Total Dollar Volume by Year. The fear of missing out was a strong component to the egregious price increases in the Fraser Valley condo market. Many Realtors intentionally priced units below market value to attract a flurry of offers. Of course this strategy only works in a market where there is intense demand and can grossly backfire when demand softens, as we have witnessed in the Vancouver detached market. Regardless, of the record high 5796 condo sales, 2510 of them sold over the asking price. That’s 43% of total condo sales, and something that is completely unprecedented for the suburbs. Fraser Valley condo Sales over the asking price by year. Clearly the Fraser Valley had an unprecedented year. Condos were trading like crypto currencies as buyers speculated on every higher prices. It seems improbable it will be able to top that in 2018 particularly with a new mortgage stress test and rising interest rates. Then again, stranger things have happened. *Areas included in the Fraser Valley include Abbotsford, Langley, North Delta, Mission, Surrey and White Rock.